Maxthon, often referred to as the best Internet browser you never heard of, is preparing to announce it is making 6GB of free cloud storage available to all comers, not just those using Maxthon. 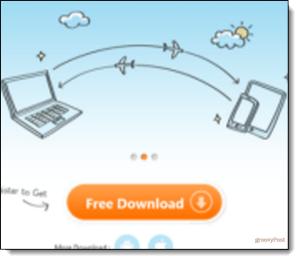 The only company offering more free cloud storage is Microsoft, which is changing its program from 25GB to 7GB, only 1 gig more than Maxthon will be providing. Maxthon touting its otherwise secret cloud storage. The cloud service, named SkyFile, is available for Windows, Android, iPad, iPod Touch, and jailbroken iPhones. A version will be available soon for the Mac, said Jeff Chen, CEO of the Beijing-based firm. Maxthon is free for Windows desktops and Android smartphones and tablets. A person does not have to use any of the Maxthon products to use SkyFile. Even if you don’t have to use Maxthon, I highly recommend it. I’ve used it for 10 years, long before I worked at Maxthon, where I had to keep track of what other browsers were up to. I’ve never found a better browser. It ties or beats Chrome for speed. It has the highest compatibility with HTML5, and it has an arsenal of tools–from password filler to ad blockers to screenshot camera to split screens–that let you tear through the Internet like a buzzsaw. According to research analysts NetMarketshare, more Windows users work with Maxthon than the better known Apple Safari. Try it, and if you disagree, 6GB of cloud storage will still be yours. With a SkyFile client installed anything you drag to or save to the SkyFile folder is encrypted, backed up, and store for you in a cloud server. You will need to install free clients that provide access to cloud files from the desktop and mobile devices, but they’re the only software you need to get.The clients also create an icon for Skyfile’s folder. The folder is accessible from any PC or mobile device running the appropriate client. Changes made from any of the tools are immediately available on the other devices. Inside the folder, in addition to any files you dragged there or saved, there is an option to share any of the files with others. SkyFile can be used as a personal filing cabinet in the sky for backup and availability from multiple devices, or it can be used to share files with friends and family members or work colleagues. SkyFile’s shared mode has dual functions. The Read-only function prevents others from making any changes to documents you’ve stored in SkyFile. With the Collaborative-sharing function, multiple users can access and write to the same folder at the same time. SkyFile keeps track of revisions in separate versions in case of a conflict in information included by different users or a need to consult earlier versions of a document. You can give an expiration date to any file you store in SkyFile. After that date others who may have been sharing the file will no longer have that privilege. SkyFile automatically encrypts and backs up your photos, videos, and documents. SkyFile’s secure account system has built-in guards to seal off your files in the event a device of yours is stolen or lost. 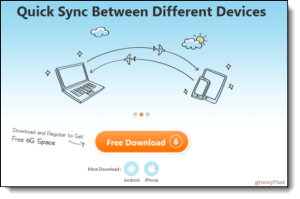 The desktop, tablet, and smartphone clients provide selective sync for folders, meaning you can choose to sync crucial files, but opt out of syncing files you want to archive. If you do use Maxthon on your desktop PC and mobile devices, the browsers will sync favorites, passwords, ad filters, Smart Address Bar, Quick Access to Web sites, and set-up options. Add dozens of new favorite sites and their passwords to Maxthon on the desktop, and the next time you pick up your Android smartphone or tablet, the new additions will be ready and waiting for you in Maxthon for Android. If you need more than the free 6 gigs, a premium account for $10 a month or $99 a year buys 50GB. Psssst….. Want your free 6 gigs of cloud storage? Here are the secret links from Maxthon? 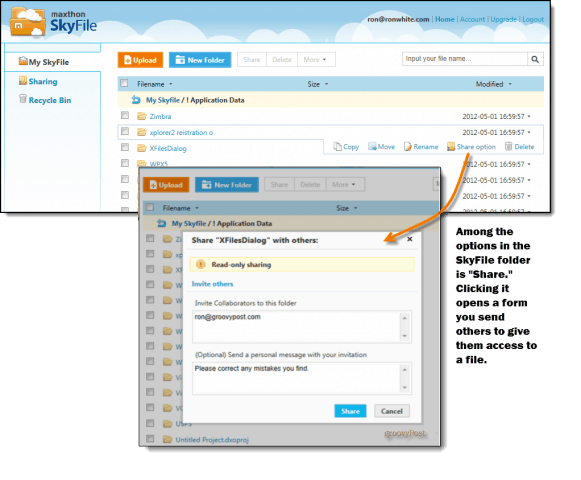 Installing any of the clients opens a page where you can register for a free SkyFile account. Skyfile is very good i’m impressed. I’ve personally not played with it yet but this will be a special project for me this weekend now that Ron published the Scoop on this! I’ve made it my cloud of choice. Microsoft’s one gig bigger, but MS keeps changing its mind about things. The Maxthon folks, I know, are remarkably single-minded.